St. John's City Council is the City's governing body of elected officials. St. John's is organized around a ward system, and Council is comprised of the Mayor, Deputy Mayor, five Ward Councillors, and four Councillors at Large. There are many ways for citizens to connect with City Council. Find your ward and learn who represents your neighbourhood on City Council. Search by your street address and view the ward map. Contact members of Council directly. Names, telephone numbers, and email addresses for all members of Council. Council meeting agendas and minutes are available online. 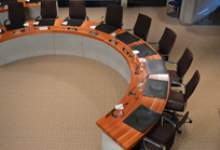 Council meetings are held weekly on Mondays at 4:30pm (bi-weekly July-August) in Council Chambers at St. John's City Hall. Citizens are welcomed to observe meetings from the public gallery. Council participate in various committees, some of which include citizen representation. The Office of the City Clerk is responsible for the administrative work of Council and, every four years, oversees the City's main public engagement activity - the municipal election.